Cyborg Sport‘s Reboot is the only post-workout product that fully addresses both nutritional and hormonal aspects of post-workout nutrition. Cyborg Sport Reboot is the only post-workout product that fully addresses both nutritional and hormonal aspects of post-workout nutrition. It is a true all-in-one product and far more advanced than any other product in this category. Being an all-in-one product it is also suitable for athletes outside of bodybuilding such as cyclists, football players, crossfit, triathletes, and boxers. Reboot contains a full serving of Cyborg Sport’s Zero™ Protein, a special non-dairy hydrolyzed collagen peptide that offers efficient absorption of 25g protein without an upset stomach. Zero also utilizes Fortigel™ Collagen Peptides which have been shown to replenish and repair worn joints. 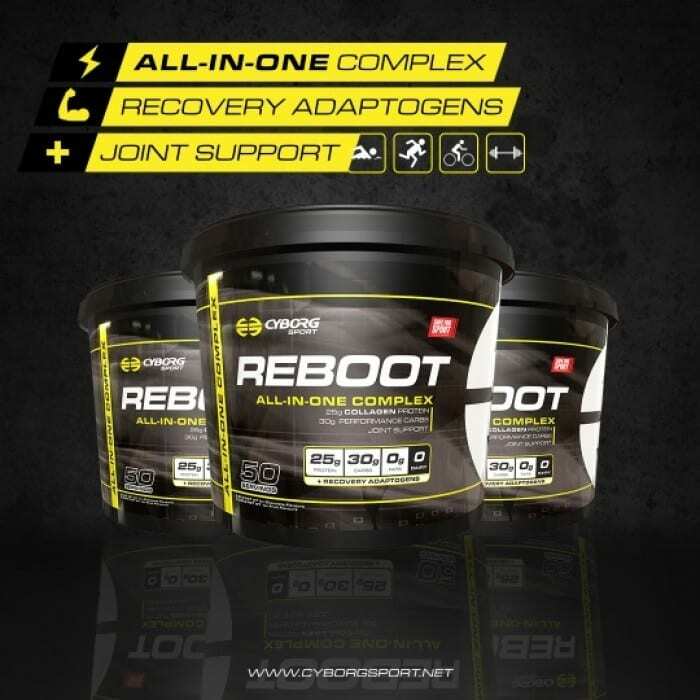 Reboot contains 30g of Cyborg Sport’s Rocket Fuel – a high molecular weight low osmolality low DE agglomorated maltodextrin. This is not like other maltodextrin and is created specifically for sports performance and accelerated digestion. CinnulinPF™ has been added to enhance the effectiveness of the carbohydrates – a Cinnamon Extract which helps to up-regulate glucose transport (insulin) to deliver the carbohydrates to your muscles faster and more effectively. KSM-66™ is a patented form of full spectrum organic Ashwagandha extract. This potent adaptagen has been shown to lower the stress hormone cortisol by up to 27.9% as well as having endurance enhancing effects. Having an excess of cortisol can cause dire effects both mentally and physically. Importantly for sports performance cortisol is a catabolic hormone that also increases the storage of belly fat. During physical activity it is normal to experience a spike in cortisol as the body and mind undergoes a stressful event however once finishing it is very important to lower cortisol quickly to begin recovery. By taking Reboot post-workout this process is accelerated and the body and mind will calm down and move from a catabolic to an anabolic process of recovery and new muscle synthesis. Each ingredient in Reboot is supporting the next and the entire formulation works in a circular feed to enhance recovery and the change from catabolism and anabolism. 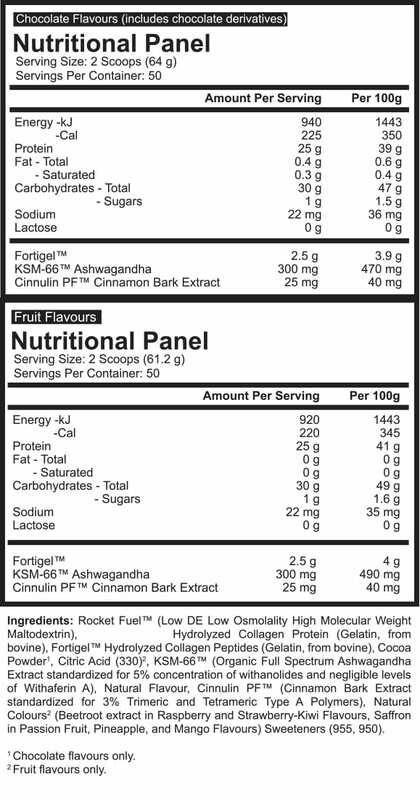 Rocket Fuel™ (Low DE Low Osmolality High Molecular Weight Maltodextrin), BodyBalance™ Hydrolyzed Collagen Protein (Gelatin, from bovine), Fortigel™ Hydrolyzed Collagen Peptides (Gelatin, from bovine), Cocoa Powder, KSM-66™ (Organic Full Spectrum Ashwagandha Extract standardized for 5% concentration of withanolides and negligible levels of Withaferin A), Natural Flavour, Cinnulin PF™ (Cinnamon Bark Extract standardized for 3% Trimeric and Tetrameric Type A Polymers), Sweeteners (955, 950). 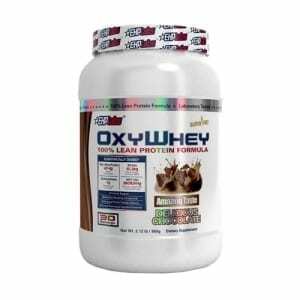 The Supplement Stop recommends mixing 1 serve (2 scoops) with 400ml to 600ml cold water in a shaker. For best results, consume immediately post workout. REBOOT can also be used during half-time of sports competition. We do not recommend exceeding 6 scoops per day.